An R-value is a rating which measures how well insulation can resist heat flow. ‘R’ stands for thermal resistance. The R value depends on the type of material, its density and thickness. Tiny air particles trapped in the insulating material resist the movement of heat (and cold). The higher the R value, the better the insulation is at reducing heat flow. This means, for example, that R2.6 insulation is more effective than R1.6 insulation. The number next to the R is just a rating of its insulating power. The higher the number the better job the insulation will do at keeping heat in or out of your home. So R30 will save you more money on your heating or air conditioning bills than R10. 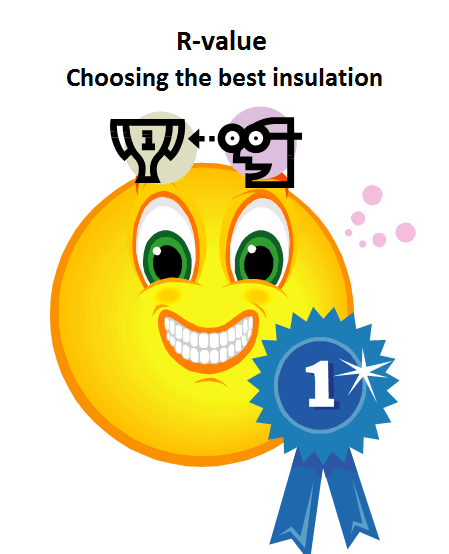 Q. What’s the first thing I should look for when I buy insulation? So, if you’re looking at insulation with an R value of 38 from Company A and insulation with an R value of 38 from Company B, you’ll know the two products offer the same level of insulation. That’s true even if they’re different kinds of insulation — say, if one is blanket insulation, which comes in batts and rolls, and the other is loose-fill insulation, which comes as loose fibers or fiber pellets and requires special equipment to blow it into a space. What is the appropriate R value for insulation in my home? Where you live. You’ll need insulation with a higher R value if you live in a cold climate like the Northeast than if you live in a warm climate like Southern California. How your home is built, and where the insulation will be. Is it a single-level or multi-level structure? Do you have cathedral ceilings? Is there a basement, or is your home built on a slab? Each of these factors helps determine the level of insulation your home needs. How you heat and cool your home. Whether you have a furnace, central air conditioner, or a heat pump can make a difference in your insulation decisions. Should I use the same R value of insulation throughout my home? It’s more efficient to use insulation with higher R values in the attic and in rooms with cathedral ceilings than in wood frame walls, basements, or crawl spaces with walls. A good way to see where energy is being wasted in your home is to do a home energy audit, which involves looking at your heating system, insulation, windows, doors, and other parts of your home to determine where you might be losing energy. You can do a basic walk-through yourself, or hire a professional to do a more thorough audit and make specific recommendations on how to make your house more energy efficient. While this all may seem quite technical, having a basic understanding of the R value will greatly improve your ability to make informed decisions on insulation.